Everyone thinks they have the cutest pet ever, but can you get the votes to back it up? 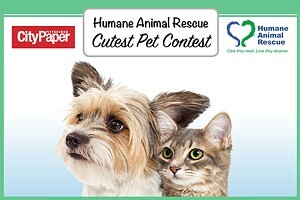 Submit photos of your fur babies in our 2018 Human Animal Rescue Cutest Pet Contest now to win great prizes from our sponsors! Submissions will be accepted from April 16-24th and featured in a 2-page spread in City Paper's Animal Issue on stands April 25th! Then, you'll vote on the cutest pet. Winner will be notified on Friday, May 4th and featured in the May 9th issue of City Paper! Note: Ad blockers must be disabled to view, submit or vote for the submitted cute pet photos.